Elisa Lam, the woman's name, she is in an open elevator. He looked worried. Many times he looked out as if there was someone else there. Every now and then he jumps out and back again. He was frightened. The behavior lasted for several minutes until he finally got out of the elevator and did not come back again. Elisha Lam is reported missing. The following CCTV Record before Elisha Lam disappeared. Two weeks more searches were made but to no avail. But other oddities happen in the hotel. The guests complained because the water coming out of the tap was not as hard as usual. The water looks a bit dark and tastes "weird". The hotel clerk then checked the water tank on the roof of the hotel. After opening the locked roof door, he unlocked the hold of the tank and witnessed an unexpected sight. The corpse of Elisa Lam naked drowned in water, hovering slightly below the surface. The water used by the guests was already contaminated by a two-week-old corpse. Yikes! On 19 November 1931, a Manhattan Beach resident named W.K. Norton was found dead in his room after swallowing some toxic pills. This is the first suicide case in the hotel. In 1932, Benjamin Dodich shot his own head in the room. In late July 1934, Louis D. Borden cut his own throat with a razor in his room. He left a letter mentioning the illness he suffered. In March 1937, Grace E. Magro fell from the ninth-floor room window. Her body was caught in the phone cord that then twisted it. He breathed his last in the hospital. Police are not sure whether the incident was a murder or an accident. In January 1938, Roy Thompson jumped off the hotel roof and his body was found on top of the building next to the hotel. May 1939, a sailor named Erwin C. Neblett was killed in the room after poisoning. Less than a year later, Dorothy Sceiger used the same way to commit suicide but could still be saved. September 1944, Dorothy Jean Purcell throws her newborn son out the window. The poor baby's body was found on the roof of another building. November 1947, Robert Smith of Long Beach died after falling from the seventh floor. On October 22, 1954, Helen Gurnee also jumped from the seventh floor. February 11, 1962, Julia Frances Moore climbs out of her eight-bedroom window and lands on the second floor. October 12, 1962, after a fight with her husband, Pauline Otton jumped from her ninth-floor window and dropped a pedestrian named George Gianini. Both were killed. June 4, 1964, Osgood was found dead in the room. He was stabbed, strangled and raped. In addition to the fourteen cases above, recorded two serial killers had spent the night in the hotel while running the action. The first killer named Richard Ramirez was charged with 13 murders, 5 assassination attempts, 11 sexual harassment and 14 thefts in 1985. He stayed at the hotel while in action. Six years later, in 1991, another killer named Jack Unterweger stayed at the hotel. He killed three people before leaving Los Angeles to continue his criminal act. 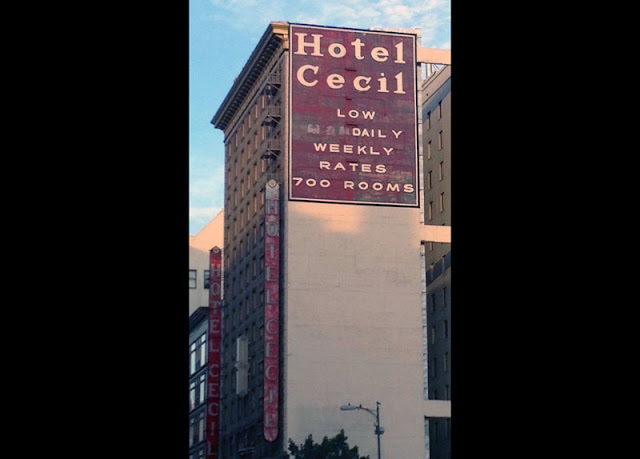 The hotel that was originally named Cecil was later renamed in 2011. But of course history cannot be erased, and in fact, case by case still occur. February 19, 2013, Elisa Lam's body was found in the water reservoir after three weeks was declared missing. The latest case, on June 13, 2015, the 28-year-old man was found outside the hotel. Allegedly the man committed suicide by jumping from the hotel room. This horrible hotel is like having a curse. Do you dare stay there?